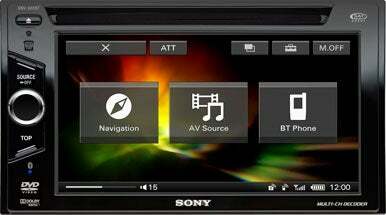 On Thursday, Sony introduced its first two in-dash car navigation systems for the U.S. market, which combine GPS, iPod connectivity, CD/DVD playback, and Bluetooth. Last week, Sony outfitted a rented minivan with its new entertainment system, and took me on a nice drive from the South of Market area of San Francisco to the Golden Gate Bridge and back to show off its latest handiwork, the 7-inch widescreen XNV-770BT and 6.1-inch widescreen XNV-660BT systems (the one I saw in action was the 660BT model). The cornerstone of the new products is GPS driving directions. Both versions come loaded with TomTom maps of the U.S. and Canada with more than 6 million points of interest, and include one year of quarterly map updates. They also use TomTom’s IQ Routes feature, which evaluates route options based on typical traffic speeds rather than posted speed limits, and will recommend the fastest route for the time of day. And MapShare lets you take advantage of map corrections submitted by other TomTom users to help keep your maps more up to date than quarterly releases can manage. IQ Routes and MapShare updates require connecting the removable GPS module to your Mac or PC (which is also how you update the maps themselves). Both systems also work directly with iPods and iPhones using a dock cable to carry audio as well as charge your device. During my demo, the sound quality was very good and what you’d expect from such a connection (as opposed to Aux input or FM transmission). Metadata and album art displayed on the touchscreen, and to make it safer to operate while driving, you can simply swipe your finger across the screen to switch to the next track, or flick upwards to move to the next playlist. Speaking of sound, the models offer multi-channel playback with virtual surround sound designed to work with the speakers already in your car and adjustable based on the position of people in the car. You also get Bluetooth support for phone calls, and A2DP support for music streaming. Sony showed the features to me using an iPhone, and demoed Pandora streaming over Bluetooth from the iPhone to the speakers. Again, sound quality was very good. And both models offer slot-loaded CD/DVD players. Although you can watch DVD movies on the screen, you can only do so when the car is in park for safety reasons. The XNV-770BT, which has no physical buttons and flips up to reveal its CD/DVD slot, costs $1300, while the XNV-660BT, with a volume knob and an eject button plus a CD/DVD slot at the top, costs $1000. Both will be available in November, and Sony told me that installation should run about $75.